In this article, let’s see what PowerShell modules are and how they help system administrators & developers in automation of regular and routine tasks. A module is a set of related Windows PowerShell functionalities that can be dynamic or persist on disk. Modules that persist on disk are referenced, loaded, and persisted as script modules, binary modules, or manifest modules. Unlike snap-ins, the members of these modules can include cmdlets, providers, functions, variables, aliases, and much more. In simple terms a module is nothing but a kind of header library as in C programming. Each module contains different set of cmdlets to perform different actions based on the application used. So, before we want to use/manage the application from PowerShell it is required to import/save/store the module files/binaries in local disk or a shared drive. These modules can be stored in user’s My documents or system root drive where PowerShell is installed. Import-Module – Use this command to import any module into PowerShell session. Get-Module – Lists out the information of all modules that have been or that can be imported to current PowerShell session. 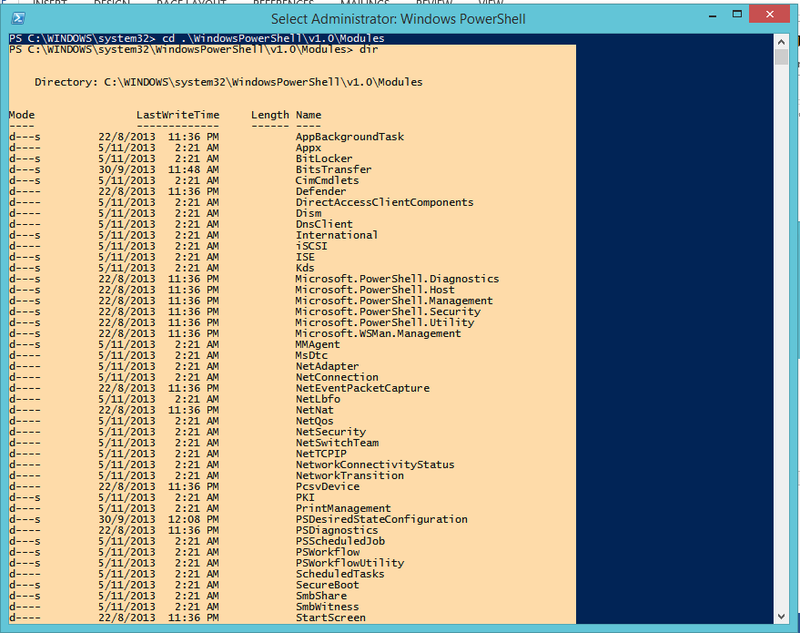 Remove-Module – Removes module from current PowerShell session. Before installing/importing any module the execution policy have to be set as unrestricted in the PowerShell session. So, you can directly import any of the existing modules by using import-module cmdlets. But in case you want to import any other module, you need to first download and copy to the any of the folders mentioned above. In next article let’s learn few basic cmdlets and start writing small scripts. This entry was posted in PowerShell and tagged PowerShell Execution Policy, PowerShell Modules. Bookmark the permalink.